Balkan Socialist Centre “Christian Rakovsky” & RedMed, Against austerity, fascism, war, environmental catastrophe, and barbarism, fight for international socialism! Revolutionary Marxism is a brand new journal of theory with quite a long history. The irony derives from the fact that this journal is the English edition of a journal that has been published in Turkish for many years. The first issue of the journal Devrimci Marksizm was brought out exactly ten years ago. That journal is now planning to publish its issue number 30 next spring. It was really the success and resilience of the Turkish edition that gave the Editorial Board its inspiration to publish an English edition annually. Both journals are based in Istanbul, Turkey, but the English edition, as well as the Turkish one, will collaborate with writers across a broad geography. The world has entered a very special epoch full of threats as well as revolutionary potential. We at Revolutionary Marxism trace the roots of this new epoch to the so-called “global financial crisis”, in other words the financial crash of 2008. That crash brought about one of the deepest and longest economic crises in the history of the capitalist mode of production, the likes of which were called by the name of “great depression” in their own day. After the Great Depression of 1873-1896 and that of the 1930s and 1940s, this is the Third Great Depression in the history of capitalism. We asserted from day one that, as in the earlier great depressions, this crisis was not going to be confined to the economic sphere but, given its deep-going nature, would set in motion a series of socio-political and military earthquakes. In particular, a simultaneous rise of the radical right and of revolutionary upheavals was to be expected. No less remarkable would the tendency to ever greater military conflicts be, some so cataclysmic as to possibly grow over into a Third World War. Those earthquakes are here. We face, in fact, a whole series of tremors of different kinds. All the consequences that we had foreseen back in 2008-2009 have been materialized. First, despite a 29-trillion dollar policy of Quantitative Easing and zero or even negative interest rates that have become the rule for more than eight years now, world trade and foreign direct investment and growth and productivity increase are still below their pre-depression levels, while unemployment and poverty and public debt are on the rise. The growth of the so-called “emerging economies”, in particular of the so-called BRICS countries, is slowing down, taking even more steam out of the world economy. Eight years into the crisis nothing has been achieved. We are, in fact, face to face with a veritable great depression. This depression has already started taking its toll on working populations around the world. The trials and tribulations Greece has been going through as a result of the dynamics the depression has unleashed are harbingers, in fact, of worse to come around the world. Second, the meteoric rise of a quasi-fascist movement and related phenomena are visible as has never been seen since the 1930s. To the growing strength of openly Nazi movements in Ukraine in the aftermath of the Maidan events and the landslide victory of so-called “right-wing populism” in the European Parliament elections of May 2014 was later added the authoritarian turn of governments almost everywhere, from Hungary and Poland to Russia and from Turkey to the Philippines. 2016 has seen two major political events that have fortified the basis of this trend in world politics: Brexit and the victory of Donald Trump in the US presidential elections. Third, a different kind of barbarism has been on the rise in the Islamic world. Most prominent is, of course, the Islamic State of Iraq and the Levant (ISIL), which has gone so far as to declare its leader Caliph of all Muslims. This is a movement that displays extremely retrograde ideological and cultural practices alongside its ruthless savagery that causes many lives. However, it has been able to attract recruits from all around the world, including Western countries, where Muslim youth experience extreme poverty, daily violence, including that of the police, and humiliation. The suicide bombings carried out by ISIL and other organizations of the same kind as well as the refugee flow into Europe, the greatest wave since World War II, provoke a further consolidation of the quasi-fascist movement, which then feeds into a further strengthening of the Islamists. Fourth, all this barbarism is nonetheless not a one-sided development. It has been accompanied by, at the other pole, the rise of revolutions and revolts and rebellions in many countries and continents, from the Arab world to the US, with its Occupy Wall Street moment, from Spain and Greece to Israel in the summer of 2011, from Turkey and Brazil in 2013 to a plethora of Balkan countries such as Bulgaria, Romania, Slovenia, and Bosnia-Herzegovina around roughly the same time, and from the impressive workers’ struggles in France against the Labour Law to the millions of South Koreans mobilized in 2016. There has also been a remarkable change of atmosphere in the political sphere in the more strict sense of the term in the advanced world: the rise of Syriza in Greece and Podemos in Spain, as well as the strange phenomenon of Bernie Sanders in the US, with a similar development in the UK in the person of Jeremy Corbyn. Finally, in a category of its own, the Argentine Front of the Left and of Workers (FIT in its Spanish acronym) provides an example of the rebirth and rejuvenation of revolutionary Marxism as a hegemonic force within the working class movement and is possibly, for the moment, the movement with the highest promise around the globe. Last but certainly not the least, wars have been ravaging many parts of the world from Ukraine to Libya, but the neuralgic centre lies of course in the Middle East, where three wars are now raging simultaneously in Syria, Iraq and Yemen, threatening to turn these into a conflagration at the scale of the entire Middle East. The war in Syria has now, for some time, been posing the prospect of a world war. Threats also exist of war breaking out in the periphery of Russia and in the South China Sea, as well as the ever present danger in Africa. The sooner the left discards its platonic love for pacifism and recollects the views of Marxism on questions of war and peace, the easier will it be to salvage the most one can from the rubble. 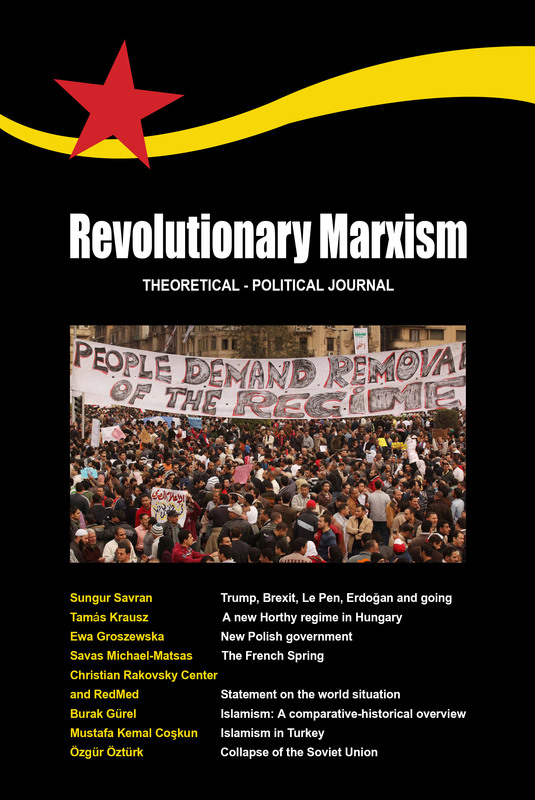 This first issue of Revolutionary Marxism provides glances at the different facets of this new epoch that we are going through, appealing in the process to the left and the international working class movement to move in directions that will spare humanity, in particular the working masses and the oppressed, from further pain and toil in the near future. Sungur Savran stresses the systemic nature of the rise of the likes of Donald Trump and lays the blame for his victory, as well as those of the other retrograde tendencies that appear around Europe, on the callousness of the left in the face of the poverty and misery of the working population around the globe, including the richest countries. By adopting a discourse that derives from identity politics, the left has simply become oblivious to the problems and sensibilities of the working class and thereby abandoned it to the quasi-fascist movement that has been waiting in the wings. Tamás Krausz is a Hungarian Marxist who has recently won the Isaac Deutscher award for his book on Lenin. He was a Marxist oppositionist under the so-called “socialist” period. He is now one of the editors of the most important left-wing journal of the country Eszmélet. Here he discusses the more and more authoritarian government of Victor Orbán in his own country in the context of the return of the practices of an earlier repressive regime in Hungary, that of Miklós Horthy from the interwar period of the 20th century. The present situation in Hungary and Turkey are somewhat similar, not only because parallels exist between Orbán and Erdoğan, but also because the parties in power, Fidesz and the AKP, are flanked by smaller parties that come from a more authentically fascist tradition, Jobbik and the MHP. Ewa Groszewska is a Polish sociologist from Wroclaw who is active in the socialist and feminist movements. In an article written for Revolutionary Marxism, she takes up the quite recently established Polish government of PiS. She points out that, as against the Europeanist and neoliberal orientation of the social democratic party, the PiS stands for the more particular interests of sections of the Polish bourgeoisie, which explains the new orientation this government represents in terms of a rejection of neoliberalism. However, Groszewska points out, this rejection of full support for the market and the adoption of partial initiatives to revive an almost non-existent social policy since the restoration of capitalism in Poland do not imply that PiS is pro-worker. On the contrary, the policy of the government is to strike at the left first and settle its own accounts with the Europeanist wing of the bourgeoisie later. If the first three articles dwell more on the retrograde tendencies of our epoch, the fourth turns to the more positive element within the current situation. In a groundbreaking account of the French strike movement against the Labour Law that lasted from early spring all the way into the summer and was briefly revived in September this year, Savas Michael-Matsas, Greek Marxist and leader of the Workers Revolutionary Party (EEK), situates this French phenomenon within the Third Great Depression, the European crisis, and the series of upheavals that both European and other countries have experienced since 2011. Michael-Matsas dwells on the originalities of the Nuit Debout movement and rejects the facile manner in which some socialists have dismissed the potentialities of that movement. Yet what characterizes the French movement in opposition to many social movements around the world in the last five years is, in the eyes of Michael-Matsas, the fact of the hegemony of the working class. The next piece is a document from end 2015. It is a political statement jointly written by two institutions. The Balkan Socialist Centre Christian Rakovsky was established around the Kosovo war on Yugoslavia in 1999 and has since organized many conferences, taking up questions relating specifically to the Balkans. RedMed (short for Red Mediterranean), on the other hand, is of much more recent vintage. Its roots lie in the Arab revolutions of 2011 and convulsions in other parts of the legendary More Nostrum. In this statement, the two centres come forth with a powerful use of the Marxist analysis to understand the situation both in Europe and in the Middle East. Having been written at the end of 2015, the text is naturally not entirely up to date, but nonetheless quite prescient in its predictions. This statement should be read as an analysis of the more structural elements of the world situation. The articles by Sungur Savran, Savas Matsas and Burak Gürel bring the situation up to date. Islamism has been a constant in the life of the Middle East and North Africa, especially since the Iranian revolution and the sending of Soviet troops to Afghanistan, both in 1979. The topic is treated in two different articles in this issue. Burak Gürel provides a comparative and historical analysis of the Islamist movements and regimes since the 1960s. Gürel defines Islamism as the political expression of the Islamist bourgeoisie’s quest to become the dominant class by establishing hegemony over the proletariat. Gürel demonstrates that the crisis of the secular regimes that started in the mid-1960s, and of radical leftist movements some what later, provided the background to the rise of Islamist movements of various types. While Islamists successfully established hegemony over the proletariat and took power with a revolution in Iran, they lost their hegemony and the struggle for power in Algeria in the 1990s. Islamists have recently entered into a new struggle for political power in countries like Egypt, Tunisia, Libya, and Syria in the wake of the Arab Spring. Gürel argues that by simultaneously adjusting to neoliberalism and establishing hegemony over the proletariat since coming to power in late 2002, the Justice and Development Party (Adalet ve Kalkınma Partisi, AKP) in Turkey has come a long way in terms of the Islamization of the state and society. Finally, Gürel draws readers’ attention to a series of recent developments in the region indicating that the future prospects for the Islamist movements and governments are far from certain. Mustafa Kemal Coşkun, on the other hand, contends that in Turkey Islamism is nourished more by the conception of Islam represented by fraternities and communities rather than high Islam or popular Islam. According to the author, the Islam offered by fraternities and communities wields a social base that is narrower. This social base is mostly composed of petty tradesmen, artisans, and owners of small and medium enterprises. In Turkey Islamism and Islamic movements emerge as a result of this class composition. This is so because communities and fraternities have organized together with the small and medium scale bourgeoisie through a thick web of networks. According to the author the importance of all this lies in the fact that Islamism is articulated to conservatism, nationalism, or liberalism, whenever the interests of the classes in question require this. On 26 December 1991, after several months of gestation, the Soviet Union was no more. A quarter of a century has gone by since the mighty state established by the October revolution, the greatest socialist revolution of history, was dissolved into its constituent republics and concomitantly collapsed as a workers’ state. Revolutionary Marxism is successor to a political-theoretical tradition that has always been critical of the bureaucratic degeneration of the Soviet Union and the other post-revolutionary societies, but has nonetheless also defended them against imperialism and capitalism, regarding them as workers’ states, albeit blocked in their transition to socialism. We believe that future socialism has an immense amount to learn from this experience, both in the economic and the political spheres. The last article in this issue addresses precisely this problem. Özgür Öztürk takes up the economic background of the collapse of socialist construction in the Soviet Union. Öztürk criticizes certain widespread fallacies, especially those that reduce the collapse to a consequence of simple mistakes on the part of the leadership or those that regard the Soviet Union as a capitalist society, albeit with its peculiarities. He then moves to explain the collapse in materialist terms, putting the blame on the fact that the Soviet Union was not able to establish the relations of production in a way that would make it possible to increase labour productivity sufficiently. According to Öztürk, given the nature of the society and the state, the real way out lay in internationalism and the world revolution, which never came on the agenda after the hold of the bureaucracy was established on the first workers’ state. The year 2017 is, happily, the centenary of the great October revolution, a revolution in which the working class was itself the fundamental social actor. We hope to take up different facets of this revolution and its meaning for the future of humanity in the next issue of Revolutionary Marxism. See in particular the statement by the Editorial Board, published in the immediate aftermath of the “global financial crisis”, in issue number 8, Winter 2008-2009, of the Turkish edition, significantly titled: “A New Epoch Is Opening Up: Financial Crash, Depression, Class Struggle”.